"The facilities and atmosphere at Oceo are amazing! I had a body massage which was one of the best treatments I've ever had by a very attentive therapist. Being a therapist and working in the spa industry myself means I'm very picky and have been to many spas however from the minute I walked into the Oceo Spa to the minute I left I felt completely rejuvenated! I would highly recommend Oceo! Their swimming pool and thermal facilities are also fabulous! At the time I booked my treatment you were able to use the thermal rooms and pool for free if you spend €50 + on a treatment which I thought was good value (however I'm not sure if this is still the case)." "I spent a day here as a birthday treat and it was perfect, attitude of the staff was so warm, helpful and welcoming, that I was made to feel like a millionaire instead of someone who booked their special offer. Facilities are fantastic perfect for an away day alone or with a group. " "Myself and 3 work colleagues have just come back from a visit to the Ocea Spa at the Seafield Hotel. 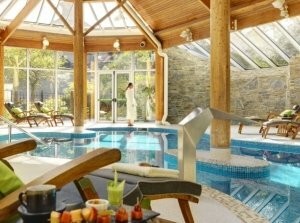 We have been to many Spas in Ireland but I have to say that this Spa is the best by far. The Staff are all 100% professionals and the whole experience was thoroughly enjoyable. I had the beautiful back treatment which included a 45 minute treatment on by back including a back and leg massage, and it was total bliss. We all spent more than 5 hours in the Spa, as they have an area to eat in as well where we all chilled in our robes and slippers after our treatments. I would definitely recommend this Spa and will definitely be back!"